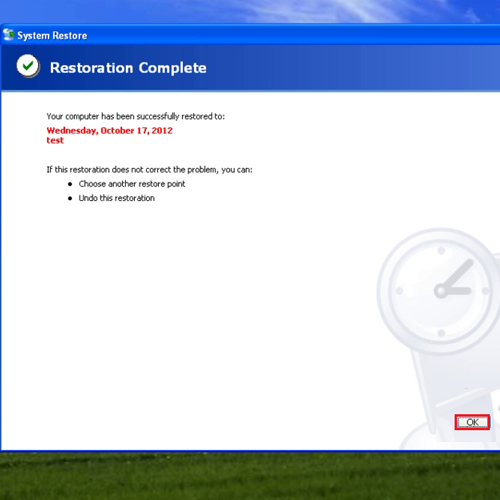 You can go back in time by restoring your windows using the restore point. Sometimes installing a program or driver can make Windows run slowly or unpredictably. By using system restore on windows 7, you can return the system’s files and programs to a time when everything was alright. In this tutorial, we will show you how to restore windows xp. 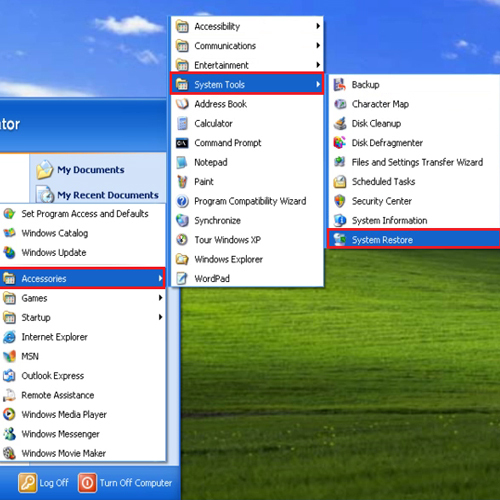 To restore windows XP, click on the “start menu” and go to “all programs” then click on “accessories” , then “system tools” and then from the list, select “system restore”. 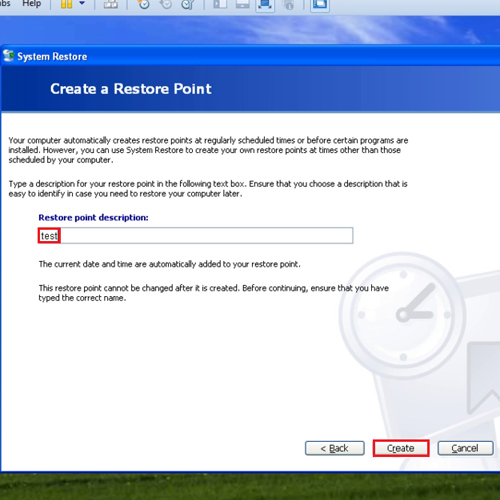 Under “Restore point description” enter the name of the restore point. The name is important as it reminds you what actually made you create a restore point. People create restore points usually before installing some software so that if the software creates any problems we can revert to our old settings using the recovery point. After giving it a name, click on the “create” button. Once the restore point has been created, make some changes on your computer like uninstall or install software or make a folder on desktop. In this tutorial, we have created a folder. 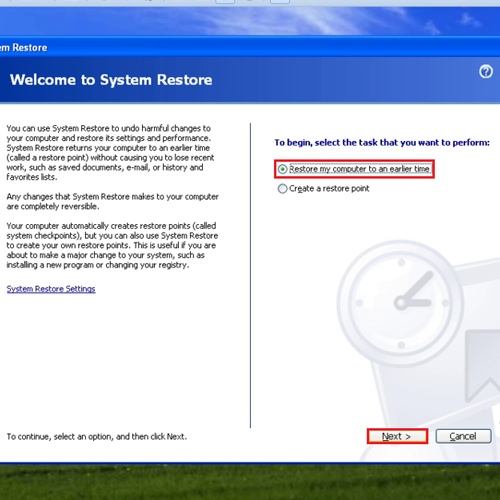 To use system restore on windows XP, go back to “system restore” and click on the radio button of “Restore my computer to an earlier time” button. Now go back to “system properties” and click on the “system restore” button. Click on the “next” button and you will be shown a list of the restore points. The latest restore point will be at the top. Select the restore point and click on the “next” button to proceed further and then hit the “finish” button. After the computer has been restarted, your old settings will be back in place. 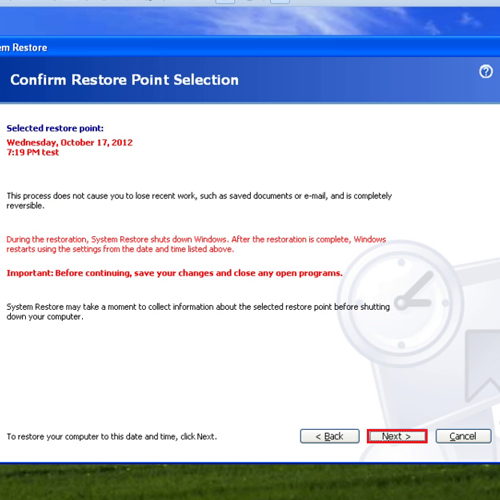 A “system restore” notification will appear on your screen telling you that which point in time your computer has to revert to. Notice that the folder which we created is not there anymore after system restore.